September is National Yoga Awareness Month! While most of us associate yoga with bendy twisty postures and would probably feel confident that we could identify it if we saw it, what we see today is actually compiled from a variety of different practices that have been utilized throughout approximately 5000 years of history. 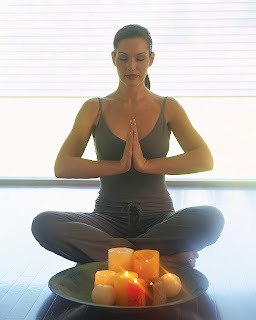 Yoga seems to have arrived in the U.S. with the Indian guru Swami Vivekananda in 1893, and has continued to grow in popularity over the years (http://www.yogajournal.com/wisdom/467). Yama - covers "moral guidelines for human development"
Niyama - this is "self-regulation"
Asana - this is the part we are typically familiar with, postures "which have specific effects on the endocrine glands, joints, muscles, ligaments and nerves"
Pratayahara - which is to "withdraw the mind from its attachment to external objects"
Dharana - this is the "concentration of the mind at a specific point"
So, while we may typically only think of the physical aspect of yoga, it is actually a complete mind/body practice designed to bring our systems into balance. Ashtanga - this is what has sometimes been called "power" yoga and fairly physically demanding. Breathing is coordinated with movement through various posture series. Hatha - this style is what was probably the first to gain popularity in the U.S. Here you engage in postures, series, and breathing exercises. There is less emphasis on fluidity of movement and more focus on stretching within postures. Iyengar - this style of yoga probably spends the most time in individual postures and focuses on working within the poses. Yoga, however, is continually evolving. For example, Bikram yoga is a form that is more recent. This style is sometimes called "hot" yoga because it takes place in a very warm room. Additionally, Ana Forrest has adapted her own style of yoga that encompasses both physical and emotional recovery. There are a variety of health benefits to be obtained from practicing yoga. It can help you increase your strength, regain good posture, and improve lung capacity. There are emotional benefits to be gained such as stress relief and increased concentration. Additionally, yoga can help to lower blood pressure, which helps keep your heart healthy. Many individuals also report relief from a variety of other ailments. However, you should definitely consult with your doctor before undertaking yoga, since this can be a challenging form of exercise. WebMD has some good information on cautions to be considered, as well as the benefits that you can reap from practicing yoga: http://www.webmd.com/balance/guide/the-health-benefits-of-yoga. Do you already practice yoga? Or, are you interested in taking up a new challenge like this? Share your ideas about this form of exercise with us in the comments below! Yoga is so much more than just doing yoga asanas. Thanks for sharing this article. Was very helpful. Great post...yoga tunes body, breath nad mind.